There is nothing more frustrating than applying two or more epoxy coating kits to your garage floor, only to discover that the colors do not match after the coating has cured. You can clearly see where the application of the first coating kit ended and where the second kit overlapped due to a slight, but distinct difference in the color tone of the epoxy or similar coating. Other issues are coatings that look less glossy and have a different color tone in some areas of the garage floor than others. So why do color inconsistencies with garage floor coatings happen and how can you avoid them? Uneven color is most common with 2-part coatings due to certain characteritics with their composition, but it can happen with other coatings as well. Epoxy floor coatings are one such example. Epoxy is a 2-part thermosetting coating that requires you to mix together part-A with part-B before application. The part-A is typically the colored resin component. The part-B is the hardener or activator that when introduced, starts the chemical reaction to begin the curing process. The part-B is clear or sometimes slightly amber in color. The part-A resin gets its color from pigments. These pigments make up part of the solids content in coatings and can settle to the bottom of the can or pouch that contains it. If the colored resin is not mixed thoroughly first before being introduced to the part-B activator, some of the color pigments that settled can be left stuck to the bottom of the container and affect the true color of the coating. This is a common DIY mistake. If you require two kits to cover your garage floor, then you increase the chances that one will be off in color compared to the other if the settled pigments are not mixed first. Another issue is that just like carpet, wood, or other flooring products, different garage floor coating batches can make for a slight difference in color. For example, if you were to purchase two DIY garage floor coating kits from your local home improvement center, there is no way to determine if they are from the same color batch or not. We actually called Rust-Oleum about this. They stated that there was no way to identify color batches from the outside of the package for both their EpoxyShield and RockSolid products. They did say that their 2.5 car garage floor coating kit is actually two single car kits in one package and should be from the same color batch. However, if you need one 2.5 car kit and one single car kit to cover your entire garage floor, they stated that the color batches are not going to be the same between the two kits. Note: Rust-Oleum is one of the few manufacturers that denotes part-B as the colored resin or base color and part-A as the activator. Regardless, all manufacturers and vendors label each container and you will know which is which. Stretching the coverage rate of coatings has less to do with the part-A colored resin. However, it is a common DIY mistake that leads to some areas of the garage floor coating looking patchy or dull and having a slight difference in color or gloss compared to other areas. RockSolid is one such coating that has had issues with this. When a coating is stretched, it cures to a thinner dry film thickness than is recommended by the manufacturer. As a result, it will take on a different color tone or appearance compared to areas of the garage floor where it wasn’t stretched. The best way to prevent this from happening with your typical DIY garage floor coating kits is to make sure that you have approximately 15% more product available over your garage floor square footage. This rule applies for the first coat only on bare concrete. 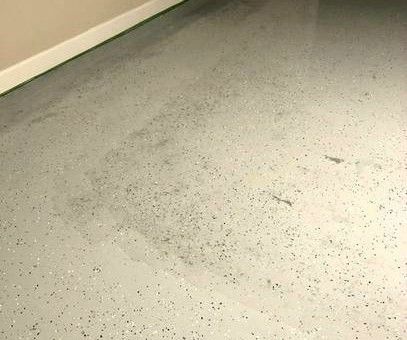 For example, if you have a 460 square foot garage floor, chances are that a typical 2.5 garage floor coating kit will not adequately cover your concrete at the recommended wet film thickness. These 2.5 car kits usually cover up to 500 square feet. 15% more of 460 is 529 square feet. Remember, coverage rates are dependent on the surface profile and porosity of the concrete. If your surface is more porous or rough, coverage rates will be less. The only time a coating will reach the high end of a coverage rate is when you are applying a second coat. You do not loose any of the coating to porosity, surface roughness, and etc. In this example we would recommend using one 2.5 car kit and one single car kit. The 2.5 car kit would be used on 375-400 square feet of garage floor and the single car kit for the remainder. This will provide for adequate wet film thickness, with more consistent color and gloss. It will also result in longer wear since the coating is at or above the manufacturer’s recommended dry film thickness. We understand not wanting to spend more than you have to. However, more than one person has ended up with a poor looking coating or had to spend more money to recoat the entire floor to fix the problem, all because they tried to save from having to buy an additional kit. High solids commercial quality garage floor coating kits need less additional materials. We recommend factoring in approximately 10% of additional material for the first coat. The key to ensuring that your garage floor coating colors match from kit to kit is to mix all of the colored resin components together first before mixing any single kits of part-A and part-B together. This is sometimes referred to as batching and is a common practice among commercial installers. You will need to purchase some inexpensive 2.5 quart disposable plastic measuring containers from your local home improvement center. You can find them in the paint section. This will allow you to pour the correct amount of premixed part-A colored resin for each part-B activator that you mix together. It’s important to keep track of the fluid ounces. Each kit should tell you how many ounces each colored resin unit contains. 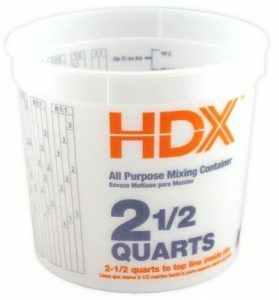 Always use a clean mixing bucket for each batch. You can use the first bucket of the remaining part-A colored resin to mix your last batch since you should be left with the proper amount if you measured your batches correctly. Be careful with mixing! Always use a fresh mixing stick or clean paddle mixer when mixing just the part-A colored resin. If you introduce any part-B activator from a used stick into the part-A, you can begin the chemical curing process prematurely. The only exception we would have for these mixing procedures is if you are applying color flakes to full refusal. This effectively covers the coating and any color discrepancies will make no difference in the outcome. Every once in a while, someone gets the bright idea to combine and mix all the kits together that are required to cover the entire garage floor for one application in order to ensure color match. DO NOT DO THIS! 2-part concrete floor coatings are thermosetting and build up heat when the part-A and part-B are mixed together. The amount of heat they develop is based on volume. If you mix two or more kits together at once, the coating can get so hot that it will begin smoking before you can get it out of the mix bucket. Even if you were able to pour it out onto the floor before it got that hot, it will begin to cure must faster and will become unworkable before you could roll it all out. That is why you rarely see a 2-part garage floor coating kit that is more than 1.5 gallons total. This goes for commercial quality coatings as well. The one exception is single-part moisture cured coatings. Polyurea is one such example. These can and should be premixed together before application to ensure color uniformity. In fact, they can be purchased in 5-gallon containers. The reason you can mix single-part coatings like this is that they are moisture cured coatings. You don’t mix 2-parts together (hence single-part). They curing process is activated instead by moisture content in the air. Once they are applied to the garage floor, the moisture in the air begins the chemical reaction. Paint and 1-part epoxy paint are another example of product that can be mixed all at once. However, they are not true coatings to begin with. They dry when applied to a surface and do not chemically cure. Following these recommended procedures to ensure color uniformity and gloss of your garage floor coating is not difficult. It just requires an additional step or two during the mixing process. Interestingly enough, when we called the Rust-Oleum tech line about identifying color batches for their kits, they recommended this procedure for all of their coatings, though they do not list this in their instructions. We found this was true for most of the other brands as well. Our guess is that these manufacturers want to keep things as simple as possible and only offer this information to those that call or contact them with a problem or question. 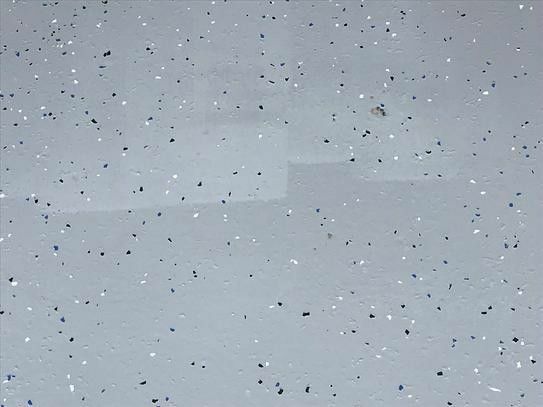 Will you experience a difference in color or appearance of your garage floor coating if you don’t follow these guidelines? The odds are more on your side that you won’t than you will. However, do you want to take that chance? There are pages of online reviews from people that complain of these exact issues. These mixing and coverage rate guidelines are recommended to ensure color matching, uniformity, and gloss for most garage floor coatings. 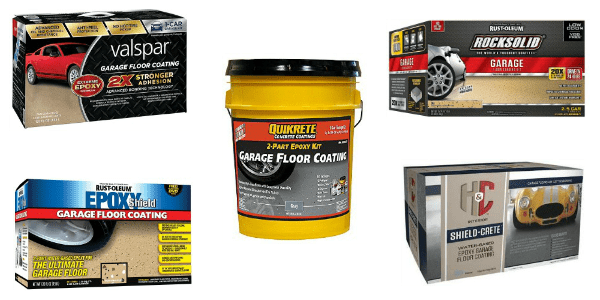 This includes the less expensive DIY garage floor coating kits as well as the higher quality commercial coatings that you can purchase from reputable garage floor coating vendors online.